In the XIII century, Viennese devotion to wine may have helped the Habsburgs take over the city. In the XV century this precious liquor was mixed into the mortar with which the famous Stephansdom was built. A hundred years later, the city exported twice as much wine as it does today. Will contemporary urban development bring about the end of an almost thousand year old Viennese wine tradition? Being introduced to the city of Vienna from the scenic lookout at Kahlenberg Hill provokes a feeling of surprise: it is unusual – to put it mildly – to see such sudden pairing of urban and rural landscape. This feeling gets more intensive after a fairly short walk to the bottom of the hill, to the first housing buildings, restaurants and traffic lights. This small distance separates two sites that seem to belong to different eras and worldviews; yet, they coexist and offer one more angle from which to look at Vienna, its history and its urban development. The fact sheets about Kahlenberg bring up the stories from the past. This territory was given as a gift to the Camaldolese Order in 1628 by Emperor Ferdinand II. Today, St. Joseph’s Church – frequented by pilgrims – stands in place of the monastery that once was there. Inscriptions on its outer walls are written in Polish, which brings us to the next important detail from the history of this place: Kahlenberg was made famous by the Polish King Sobiesky, who marched over the hill with his army in 1683 and helped to free the city of Vienna from the Turkish siege. Today, Kahlenberg is one of the most popular destinations for a short hiking excursion from the city; it is located in the Vienna Woods and stands 484 meters high – therefore, pleasant and easy to climb. However, various means of transporting Viennese citizens and visitors to the top of the hill have been employed since 1873, when the first rack railway was built for the World Expo. It stopped operating after the beginning of the First World War. 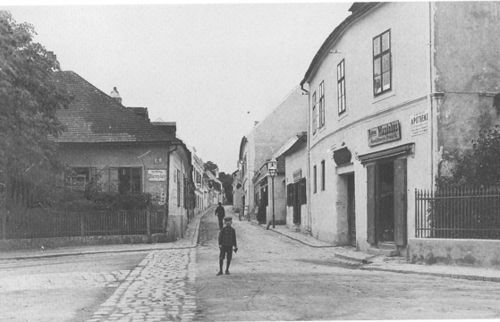 During the interwar period public works were undertaken in order to build a street leading to the top of Kahlenberg. The works were completed in 1939, around the same time when the restaurant was built here, according to the project of architect Boltenstern. These developments attracted large number of visitors. Bus line 38A made its first ascent in 1947, and it still operates today. Boltenstern’s restaurant has been renovated and turned into an event location; next to it stands the MODUL University Vienna, an international private institution, 90% of which is owned by the Vienna Chamber of Commerce. In her book “Vienna: Legend and Reality” Ilsa Barea (1966) describes Kahlenberg as “Vienna’s domestic mountain, nearly as much part of its tradition as St. Stephen’s spire.” The roots of this tradition go deeper than the history of wars against the Ottomans – they are intertwined with the beginnings of Viennese production of wine, the practice almost as old as the city itself. According to Barea, modern research has established that vines were grown in Vienna even before the Roman legionaries introduced their more refined stock. Keen and Robinson (2001) write that the history of wine in this area goes back to 276 AD, when the Roman emperor Marcus Aurelius Probus cancelled an edict that forbade wine growing in the provinces. They note that Vienna has later named a street in Heiligenstadt, the lower part of Grinzing, the most famous Viennese wine-growing district, after him. 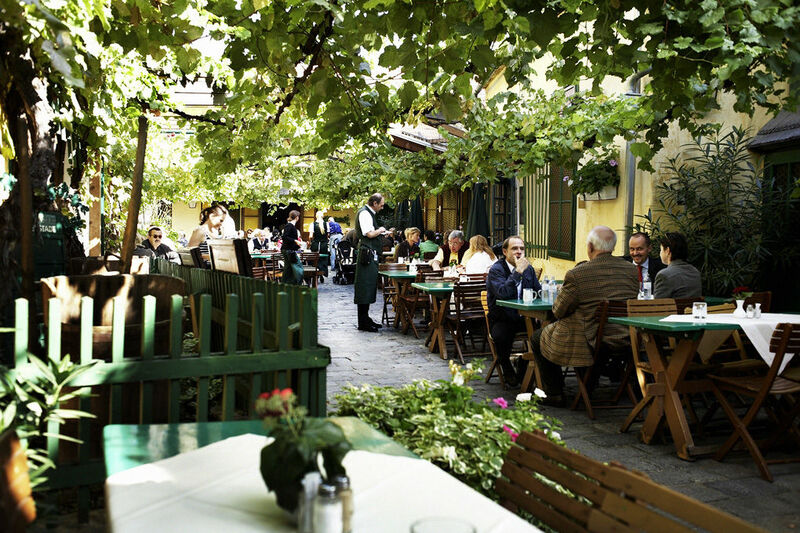 Their essay concentrates on the origins of the heuriger and its cultural significance in contemporary Vienna, but it also reveals many fascinating stories that show how intertwined the wine making is with city’s long history. One of them tells us how Viennese love of wine possibly helped Habsburgs to take the city: “When Rudolf of Habsburg besieged Vienna in 1276 to defeat the Babenberg ruler Ottokar II, his forces were much inferior to Ottokar’s. However, following Habsburg’s threat to destroy all the vineyards around the city, the Viennese abandoned Ottokar and Rudolf took over. The vineyards were spared and the Habsburg rule lasted until the end of World War I.” Authors note that the devotion to wine was continued during the rule of Habsburgs: “In 1456 the vintage was so sour that the people began to pour it into the streets, but the Emperor Frederic III forbade such a waste of God’s gift. He ordered that the wine be used instead to make the mortar needed to build Vienna’s famous Stephansdom, the tower of St. Stephen’s Cathedral around which the commercial center of the city has sprung up.” It is fascinating – and very appropriate – that Viennese wine is part not only of city’s heritage, culture and lifestyle, but also of the mortar which was used to build one of its most famous landmarks. Kurlansky accuses the city government of being oriented exclusively towards urban issues and not very familiar with or sensitive to farmers and agricultural problems. He notes that there are records from as early as 1937 witnessing about the confrontations between the city government and the growers, over preserving their way of life, detouring traffic, and controlling new construction. However, the situation became even more serious after post-war occupation ended in 1955. Kurlansky cites a Grinzing organization, according to which there were 100 houses in Grinzing in 1956. By the early 1980s, there were 600. 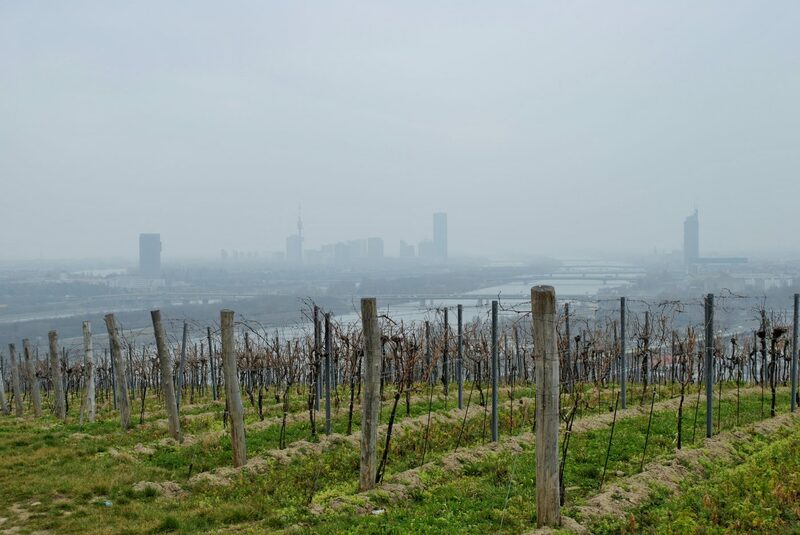 Because of its desirable location – between the Vienna Woods, the city, and the Danube – the property value and its prices have increased substantially, motivating the wine growers to sell their land. Consequently, number of wine growers in Grinzing decreased dramatically: from 120 in the mid-1950s, to only 20 at the beginning of the 1980s. Kurlansky writes about Vereinigung de Freunde Grinzings (Friends of Grinzing Association), the organizations of Grinzing vintners taking action to preserve the vineyards, which was founded in 1976 and at that time headed by Franz Hengl, whose family has been producing wine since 1137. This organization found an unconventional way of advocating for their cause: they established a price of 3,000 Austrian schillings (worth about 180 dollars at the beginning of the 1980s, which would be around 500 dollars today), for which they sold one square meter of land with one wine-producing vine on it. The new owner is entitled to half a liter of wine a year. The property can be passed to heirs but it can never be sold, and the land cannot be used for any purpose other than wine-producing. This practice gained even more attention after some international as well as Austrian celebrities became vine owners: Jimmy Carter, Leonid Brezhnev, Sophia Loren, and Bruno Kreisky, for example. In the early 1980s, there were 5,000 owners internationally who owned more than two-and-a-half acres of vineyards. The money raised by this type of activism was used by the association – “to buy land as it goes up for sale and for legal actions against developers, bankers, and other financial powers.” It is clear that wine growers of Vienna were very concerned about the future at the beginning of the 1980s. Today, it seems like things have improved to a certain extent. 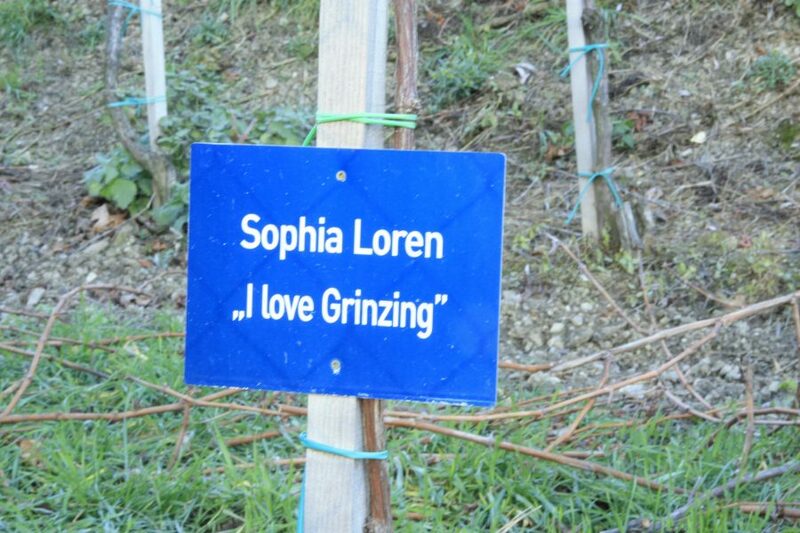 Sophia Loren’s vine in one of Kahlenberg’s vineyards. In the last few years, there have been several initiatives for international recognition and protection of both the wine produced in Vienna and the landscape of vineyards that spreads beneath Kahlenberg. In 2013, the City of Vienna requested that the Grinzinger wine region be placed on the Austrian list of suggestions for UNESCO World Heritage sites, which is created by the Ministry of Culture and then communicated to UNESCO. According to Oekonews.at, the study of World Heritage-court expert Christian Schuhböck confirmed the World Heritage-worthiness of this region. Along with Wieninger, other renowned winemakers in Vienna (Rainer Christ, Richard Zahel, Michael Edlmoser, Mayer am Pfarrplatz, Cobenzl) formed the group “Wien Wein” in 2006 with an aim to maintain the tradition and quality of Gemischter Satz and promote Viennese wines. The international recognition the blend has gained in recent years is likely due to the activities of this group, at least to some extent. It seems that Viennese wine growers and lovers have found ways of using contemporary trends in heritage protection and niche industries development to make Viennese wine growing more famous and hopefully more prosperous. One of the results might be stronger support from the the City of Vienna in preserving the landscape as well as in encouraging production. The hope remains that the Kahlenberg, its vineyards, and the urban area resting at its base will continue to improve their symbiosis in the years to come.